During a 2 p.m. press conference, Gov. Andrew Cuomo asked businesses to close early and said he is still worried for a 5 p.m. “rush hour” Thursday when he anticipated more vehicles on the roads impeding snow removal efforts. Cuomo urged everyone to stay off the roads, but said that if the snow plow drivers are allowed to do their jobs, things should be “OK” for the Friday morning commute. He noted that additional snow plows were purchased recently so there is more cleanup equipment and personnel available than last year. Asked about closing the Long Island Expressway, the subways and the airports, Cuomo said those are difficult decisions to make, but he didn’t think those calls were necessary at this point. Suffolk County Executive Steve Bellone warned that on Friday some dangers presented by the storm are expected to continue, particularly icy roadways. Although plows had cleared snow from streets in Glen Cove, many sidewalks were not shoveled, forcing some pedestrians onto the roadway. 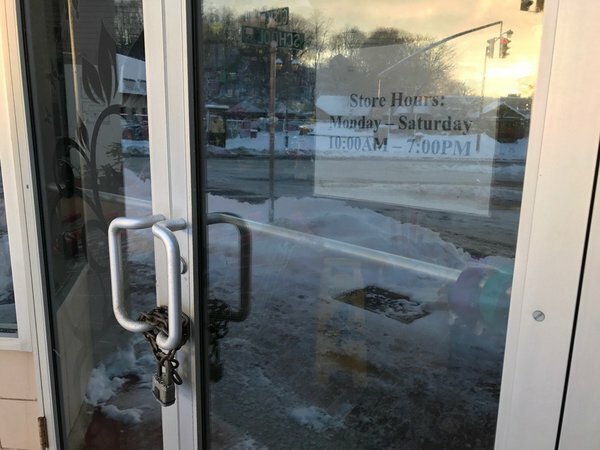 Quevin Garcia, 17, was walking down Glen Street and Cedar Swamp Road Thursday afternoon after reporting for work at Dunkin’ Donuts -- and finding the doors locked and the restaurant dark. 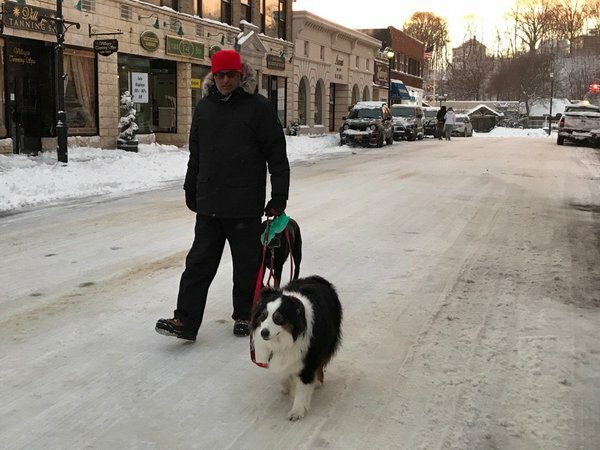 Garcia was wearing sneakers as he trudged through the snow near the side of the street as the few vehicles on the road passed by. “I’m not really prepared for the winter,” he said. Garcia walked past trees with snow clinging to branches and past blankets of white covering pavement and grass. He sees nothing beautiful about it. Roslyn Weiss had to travel from Glen Cove to Manhattan Thursday for work, but she didn’t even think of taking a snow day. She’s a nurse at a home healthcare agency, and she felt obligated to be at work, in case a patient needed her. “It’s about patient safety,” she said. Weiss took an earlier-than-usual Long Island Railroad train Thursday morning, to make sure she arrived on time. She was grateful LIRR did not shut down service. Weiss’s afternoon train arrived in Glen Cove about 20 minutes later than scheduled, because, she said, of track problems at Jamaica station. But, considering the heavy snowfall, “it was not bad,” she said. About 1,100 Southampton Town residences are still experiencing power outages, Supervisor Jay Schneiderman said. 435 of those outages are in Hampton Bays. PSEG officials told Schneiderman they expect to have power restored to most affected households by 9:15 p.m. A few outages may not be restored until morning. Schneiderman said he has notified police and town staff to be ready to open up an emergency shelter in Hampton Bays should power not come back on tonight. He said school officials are weighing whether to schedule a 2-hour delay tomorrow. In East Hills, the village offices are closed for the day, said Mayor Michael Koblenz. The village hall is only open today for village residents who have lost power at home and need a place a safe haven. Koblenz said village plow trucks have been out all morning pushing away, but snow continuing to fall is creating a challenge for workers. There have been a number of accidents reported on Long Island, but Gov. Andrew M. Cuomo said he had not received any reports of injuries or deaths. In New York City, there was one death reported, but Cuomo said it was a heart attack related to shoveling snow. Several factors led Cuomo and his team to keep the roads on Long Island open. The state purchased “dozens” more snow plows this year, which means more workers and equipment are out there clearing the roads. And, the forecast for this storm is not as bad as in previous storms. “But you calibrate this call as you go through it,” Cuomo said. If conditions change later today, he and his team will revisit the decision. The danger, Cuomo said, is when motorists become stuck on the roads, causing traffic to back up and preventing snow plows to get through. “But, with this volume, with this amount of snowfall, right now I don’t think there is going to be a reason to close the roads,” Cuomo said. Glen Cove City Hall is open normal hours today, but by mid-afternoon, only five people had paid the first half of their Nassau County taxes, even though the deadline is Friday, said senior account clerk Amy Franklin. Most employees arrived as usual for work, and without the phones ringing and customers lined up at the window, Franklin and her co-workers have been able to catch up on other work. Jerry Pariaros sees it as his duty to keep working during the blizzards. That’s why his shop, Supreme Philly Cheesesteaks in Babylon Village, was open Thursday afternoon. “It’s important,” said Pariaros, 48, who lives in Plainvew. The storm did not faze him. At a press conference in Suffolk, Gov. Andrew Cuomo said he has directed state agencies to let employees go home earlier today and urged businesses to do the same. “The low volume [TRAFFIC]in the road at his time is actually helping us because the plows can stay ahead of the snow,” Cuomo said. He’s worried about 5 p.m. when people are leaving work and snow is expected to continue. Cuomo’s office said that non-essential state employees in Suffolk and Nassau can leave work at 3p.m. “And, if you have additional volume that slows down the plows, and then that complicates the issue,” he said. On the ride out from Manhattan to Suffolk, Cuomo said he saw dozens of motorists stuck on the road and the off-ramps. Once again, he urged people to stay home. “Remember, it’s not only endangering your life, you are endangering the lives of other motorists and the over 4,000 workers who are out here to try to keep people safe,” said Cuomo. He said snow is tapering in New York City. But the storm is still dumping snow in Nassau and Suffolk. “The bad news is Suffolk is getting the brunt of the storm,” said Cuomo. The heavy snowfall, combined with winds gusts of 40-50 mph, makes a dangerous combination, he said. Thousands of flights have been cancelled at New York-area airports, he said. “The situation at the airports is ugly, for a lack of a better word,” he said. 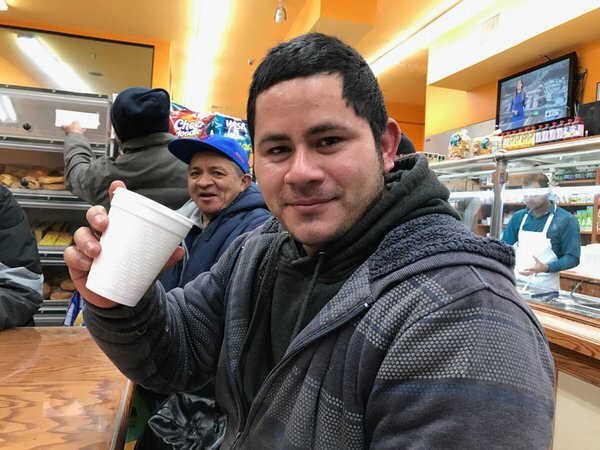 The blizzard may have closed schools and knocked out power in Southampton Village, but some residents still welcomed the storm with open arms. Leah Sellinger, 16, said she and her friends were heading to the beach to go sledding. “Anything where we don’t have school is fun,” she said. Tom Bourke went out for a stroll as snow heaved down around 1 p.m.
Annemarie Siefert said her children had “a big sleepover” last night and “are having a ball” while home from school. “My kids are home and they’re playing in the snow. I want to get home and make cornbread and watch movies,” the financial services employee said as she left work because of the snow at 1 p.m.
Siefert said she also planned to stop by the beach. “A blizzard out here is a double treat because the ocean is gorgeous,” she said. Jay Diesing, who left work at UBS because of a power outage, felt similarly.